Next in the "More than 100 things every religious liberal should know"
The “Four Vedas” are sort of like the holy books of Hinduism…only more like an “order of worship” or “common book of prayer.” Like Christianity, Hinduism has sects (denominations, as a parallel) and like Christianity, the Vedas are considered by different sects has having different levels of authority. The Sanskrit word “veda” means “knowledge” or “to know” – like our Bible, the Vedas contain the knowledge needed to follow that religion. Each “Veda” contains a different type of knowledge. “Rigveda” – “praise or verse” + “knowledge.” Some of the verses have been recited in worship since they were written, and are still being used today, making it one of the longest running religious texts in history (although not the oldest.) Unlike Christianity, these Hindu texts are dedicated to various deities, each reflecting the beliefs of what that god has done and how Hindus honor that particular god. “Yajurveda” – “sacrificial formula” + “knowledge.” These writings are the “liturgy” or mantras used during sacrificial rituals. “Samaveda”– “melody” + “knowledge” are the hymns that are sung. Half (75) are from the Rigveda, the other half are specifically to be sung by priests in rituals were the juice of the soma plant (along with other ingredients) is offered to various deities. The last Veda, Atharvaveda, is a combination of writings. Spells and magic, hymns and poetry, rules and regulations. This work includes healing (physical and spiritual, including diseases via demon possession,) writings on the nature of the universe and humanity, "household codes" (rules for running a smooth home,) marriage and funeral rituals, and more. This seems to be the "how then shall we live" book of Hinduism. I'm learning that all religions have a few things in common, yet all are different, and they cannot all be "true." C.S.Lewis said (paraphrased) - all truth is God's truth. We should be able to see what is right with other religions, and reject what is wrong with them, in order to embrace our own. Posted in More than 100 Things. Tags: More than 100 things on April 30, 2014 by MzEllen. I love you this much…. “When we think of Christ dying on the cross we are shown the lengths to which God’s love goes in order to win us back to himself. We would almost think that God loved us more than he loves his Son! We cannot measure such love by any other standard. He is saying to us: I love you this much. Posted in Quotes. Tags: Christianity, crucifixion, Jesus, quotes on April 14, 2014 by MzEllen. As I sat at a picnic table, one of my favorite places to stretch after a walk, and I heard a rustling in the trees behind me. Always aware that wild pigs hang out in this park, I always check those rustling sounds. I've never seen a pig, but lots of deer, and Phil and I saw a bobcat once. This time it was a wild turkey. Anyway, I noticed the grass. 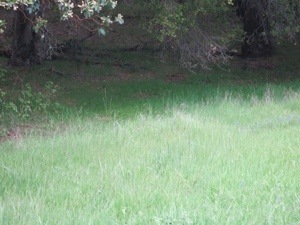 The deer and other grass eaters that live here like the meadow areas, and this one has trees around for shelter from human (and predator) eyes. See in the photo, the clear line of shade and sun...and how the grass stays short and a little sparse in the shade, but grows with wild abandon in the light. The grass grows best where the sun shines most. I had read in "Everyday Prayers" how we should start each day with the gospel, letting the Holy Spirit minister grace to us each day. Then came to mind "justification." - the moment we are declared righteous by the blood of Christ, to become the righteousness of God. The grass is planted. Tullian Tchividian says (roughly) that our sanctification is being pointed back to our justification. Partly, but I think that's only part of the story. We use our justification as motivation for our sanctification. I believe in a monergistic justification, but Scripture does speak of working out (not for) our salvation. It speaks of the works that are prepared for us in advance, it speaks of studying, of becoming more like Christ. We will fail; we will sin. We should (and must) remain secure in the knowledge of our justification. This, the gospel, should stay in our minds each and every day. We should have more than living in the past set in our sights. We are rooted in the past, our justification. Our justification - being found in Christ - causes our sanctification. I believe in a synergistic sanctification. Growing in Christ takes our work - powered by the Holy Spirit, granted by God, grown by Christ. Christians grow best where the SON shines most. Only when we continually bask in the love of the Saviour, and yes, pointing ourselves back to our justification, only when we bring ourselves out of the shadows of our sin, only when we walk in His light, and His Word, do we have the basis for the works that He has prepared for us. Posted in Christianity. Tags: Almaden, Christianity, sanctification on April 12, 2014 by MzEllen.